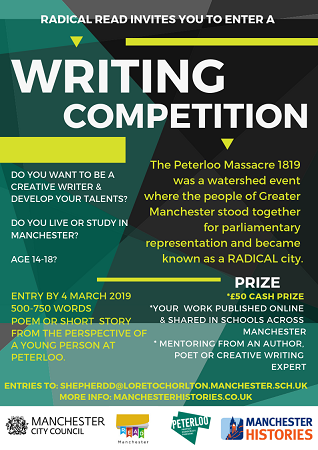 Young people in Manchester, aged 14-18, are invited to enter a remarkable creative writing competition taking them back in time to the Peterloo Massacre of 1819. Open to all young people aged 14-18 who are living or studying in Manchester, the competition asks young writers to write a short story or poem (500-750 words) written from the perspective of a young person at Peterloo. Entries should be sent by email to shepherdd@loretochorlton.manchester.sch.uk no later than 4 March 2019. The winning entry will feature in Radical Read: a young person-centred information and learning pack for schools, which looks at the involvement of young people in peaceful protests over the last 200 years. It includes a section about The Peterloo Massacre that took place in Manchester in 1819. Radical Read is part of activities happening this summer to commemorate it’s bicentenary.